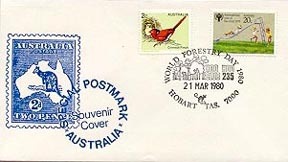 Postmarks – The Australian Philatelic Society Inc.
A Postmark is a postal marking made on a letter, package, Postcard or the like indicating the (more or less precise) date and time that the item was delivered into the care of the postal service. Modern postmarks are often applied simultaneously with the Cancellation or “killer” that marks the postage stamp(s) as having been used (though in some circumstances there may be a postmark without a killer, and sometimes the postmark and killer form a continuous design), and the two terms are often used interchangeably, if incorrectly. Postmarks may be applied by hand or by machines, using methods such as rollers or inkjets, while digital postmarks are a recent innovation.